Save Point is my entry for the 2014 Indie Game Maker Contest. According to the rules, the game is short (less than an hour). Since I wanted to focus on the mechanics more than the story, the game's story is very simple. It is also my first attempt at making a game on Game Maker Studio, so there might be some problems here and there. I got rid of a lot of bugs that would crash the game, so hopefully there shouldn't be any left. Anyway! A group of young hunters are trying to go back home after hunting a rabbear. Sadly for them, a terrifying beast blocks their path and kill them. Well, that's what they thought anyway; they don't seem to be able to die. Trapped in the forest, they decide to look for another path. Save Point introduces a dynamic battle system mixed with a classic ATB system. 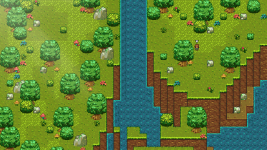 The player has to choose an Auto Action, which will automatically cast itself repeatedly until the player changes it. This Auto Action can be any skill the player has learned before, but are slightly different than when they're casted as a normal Action. Each character can have a maximum of 4 Auto Actions equipped. That includes enemies, who will use them as well. They won't target anybody though, as each party member generates anger towards enemies whenever they perform any kind of action. If you don't like the default controls for the keyboard, please feel free to change them in the options menu. Version 2 of Save Point is here! Added a new zone that links the beginning maps with the latter maps. Some zones have changed to reflect this change. 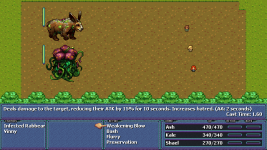 Added "Tamed Rabbear" and "Infected Rabbear" as new enemies. Added actions description in combat. Added enemies' health bars in combat. Added "Enraged" effect, disabling normal actions but increasing the speed and damage of auto actions. Added a new scene early in the game and changed a few scenes. Enemies encounter rate has been reduced. Exploring should be more enjoyable now! Added a small cursor above the player's head to easily find him. New encounters have been designed through the whole game. Rebalanced the game so that unlocking new skills is faster and combats are shorter. Enemies and playable characters' stats have been changed a lot. Fixed a bug where the player could walk on water. Fixed a bug where the player could get stuck after jumping or teleporting. Fixed a bug where music would not play after the party died. To learn more about Save Point, check it out here on indiedb! This is the latest version of Save Point. Simply open the file and follow the instructions on the screen. The game looks fun! Also, I'd just like to ask, how did you manage to code the player character to snap to the grid that smoothly? I'm trying to make a game as well (using the same game making software as you) and I can't get my player character to snap to he grid smoothly. He'll snap to the same tile space he was standing on if I press the movement button too quickly.